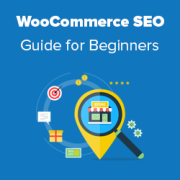 Do you want to improve your WooCommerce SEO, but not sure how to get started? Search engine optimization (SEO) for your eCommerce store is an equivalent of having someone standing on every street corner in the real world, spinning signs with your store’s name and direction. If you have not optimized your WooCommerce store for SEO, then you are missing out on a lot of sales. 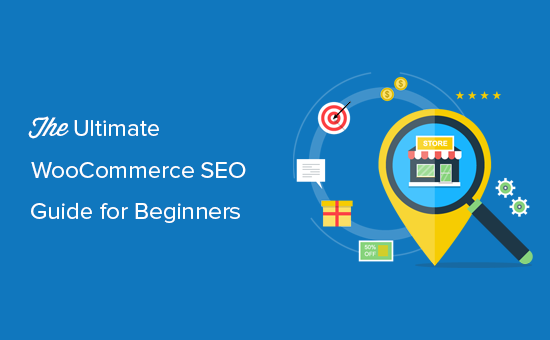 We have created this ultimate WooCommerce SEO guide to help you improve your WooCommerce SEO and get more customers. Before we get started, let’s cover the basics. Before starting an online store, most beginners usually ask one of the two questions: How does WooCommerce compare to Shopify and is WooCommerce SEO friendly? We have created a detailed comparison of Shopify vs WooCommerce that you can use to see which is the better platform for you. WooCommerce is very SEO friendly out of the box. It runs on top of WordPress which itself is standard compliant and good for SEO. However, you can definitely use plugins and techniques to further improve WooCommerce product SEO. When you start an online store with WooCommerce, it is up to you to add things like themes, products, description, images, and other content on your store. You’re responsible for optimizing all additional content that you add. WooCommerce SEO is an ongoing process, and you will need to keep it up to steadily see growth in your search engine traffic / sales. Now you might be wondering, what do I need to properly deploy an effective WooCommerce SEO strategy? Well, that’s where our WooCommerce SEO guide can help. We have broken down every thing for you. WooCommerce is a WordPress plugin, which means you need to improve your overall WordPress SEO setup before you can move on to WooCommerce specific SEO tweaks. We have created a complete WordPress SEO guide for beginners. It is extremely detailed, and we highly recommend going through the entire guide first before moving onto the step 2 of this article. However if you’re in a rush, then the most important thing you need to do is install and setup the Yoast SEO plugin on your site. Yoast SEO plugin will help you add SEO sitemaps along with setting up proper SEO fields for your products. Once you have setup Yoast SEO, you can move on to step 2 of our WooCommerce SEO guide. Just like you optimize your blog posts for SEO, you also need to optimize your individual WooCommerce products for SEO. One of the most important part of WooCommerce product SEO is to write SEO-friendly product titles. These product titles appear in your browser’s title bar and are used by search engines as the title of a search result. If you followed the previous step, then you would have already installed Yoast SEO plugin. It is the complete WordPress SEO suite that covers your WooCommerce products as well. You need to start by editing a WooCommerce product and scrolling down to the Yoast SEO box section. 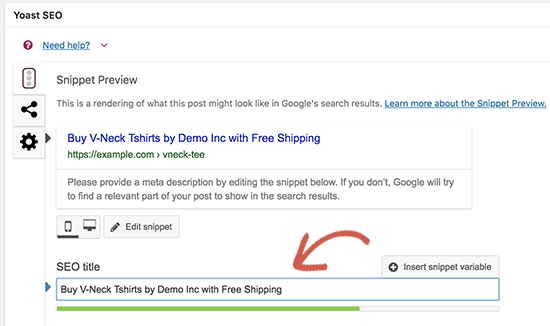 Next, you need to click on the post title as shown in the snippet preview, and Yoast SEO will display a field where you can edit the product’s SEO title. Your WooCommerce product SEO title can be slightly different than the product title on your store. You can use keywords that you think your customers will use when searching for the product. You also need to make it catchy, interesting, and attractive to users. However, it’s important not to use misleading or incorrect titles that would trick users and search engines because that could get your website penalized. Let’s take a look at an example title below. In our SEO optimized title, we’re mentioning long-tail keywords like bi-fold, brown, durability all things that people will search for when searching for “men’s leather wallet”. When shopping online, people type detailed search queries instead of generic ones. By adding long-tail keywords in your WooCommerce product title, you help search engines find and rank you higher than your competitors. Just below the title in Yoast SEO, you will also see a box to add your own product meta description. While this description is not displayed on your website, it will be used by search engines to appear below your product title. You need to make sure that you use this description to provide a compelling reason for users to click and view your product. Think of this as your one-line sales pitch. Don’t forget to use the same keywords that you used in the product’s SEO title. This will boost your chances on ranking for those target keywords. Slug is a product’s nice-name used by WordPress in your URL also known as permalinks. By default, WooCommerce uses your product’s title as the slug. However, sometimes the default slugs do not include any relevant SEO keywords. You can change that in your product’s SEO settings. 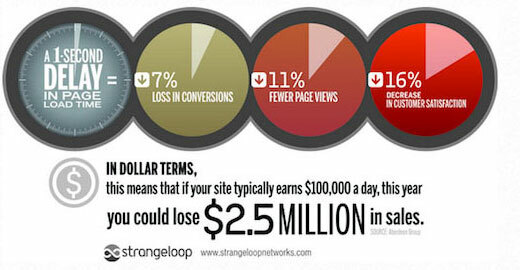 Make sure that you use your main keyword in the slug and don’t make it too long. Breadcrumbs are great for internal linking because it defines a clean path or trail to the page you are on. These breadcrumbs also appear in search results giving your site extra advantage in rankings. 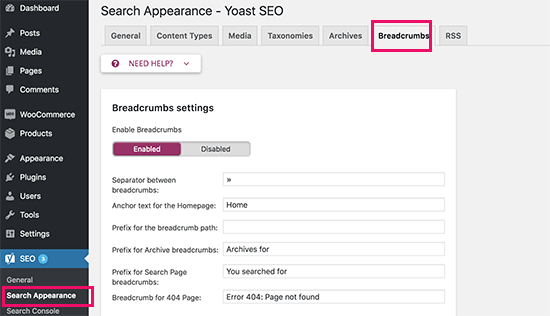 You can enable breadcrumbs for your WooCommerce products by adjusting Yoast SEO settings. Simply go to SEO » Search Appearance page and click on the Breadcrumbs tab. Next, you need to make sure that breadcrumbs option is set to ‘Enabled’. Additionally, you can also use product category in your breadcrumbs. 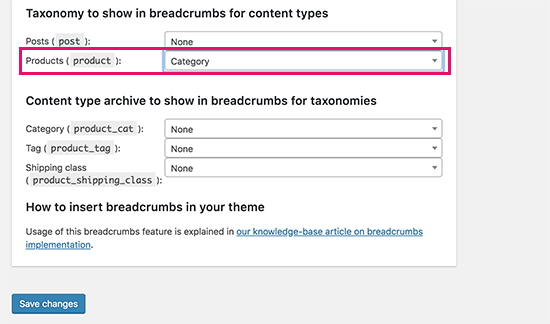 To display breadcrumbs in your WooCommerce theme, you will need to add the following code to your theme or child theme. Simply edit the header.php file for your theme and add this code towards the end. To learn more about breadcrumbs, see our article on how to display breadcrumb navigation links in WordPress. If you’re using one of these best WooCommerce themes, then they will likely come with built-in breadcrumb functionality. 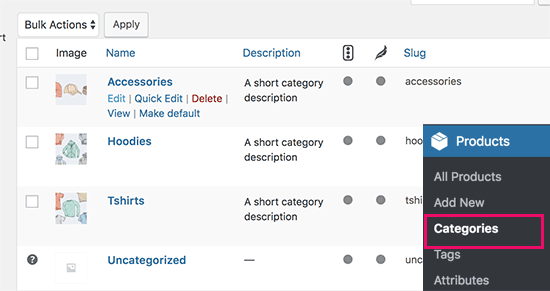 Product categories and tags help you organize products throughout your online store. This makes it easy for your customers to find the right product they’re looking for. Categories and tags also help search engines in the same way. Each product category and tag has its own page in WooCommerce which is crawled and listed by search engines. Since these pages have similar products, this increases their keyword density and making them more likely to rank for those keywords. Many beginners get confused about the difference between category and tags and end up using them incorrectly. Categories are meant for the broad grouping of your products. If your store was a book, then categories will be the table of contents. For example, a clothing store can have categories like men’s, women’s, accessories, jewelry, etc. Categories are hierarchical, so you can add child categories to them. On the other hand, tags are more specific keywords that describe the properties of the product. For example, a t-shirt product can have tags like casual, summer wear, and more. For more on this topic, see our guide on the difference between categories vs tags. Many customers switch to image search to quickly find products that they are looking for. To help website owners, Google recently removed the ‘View Image’ button from their image search results. This means that users will have to visit your website to see the image with context. This trend further helps online stores drive highly-motivated customers to their websites. Image SEO works a lot like web search. Google uses artificial intelligence, image recognition, and other algorithms to help users find the images they are looking for. The most important thing you can do to get traffic from Google image search is adding alt tag to all images on your website. Alt text is an HTML attribute which allows website owners to add some text with their images. The purpose of this text is to be displayed when the browser is unable to fetch an image. Search engines use this alternate text as a ranking factor in their image search. Basically, you can add text to describe what this particular image is about. 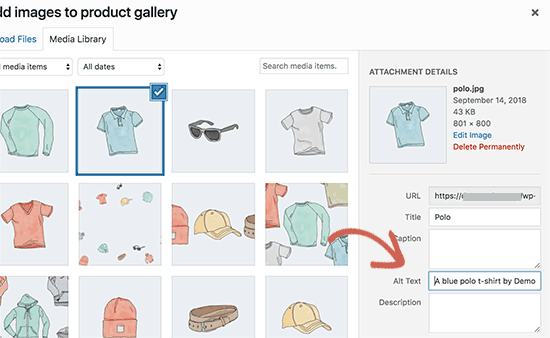 You can add alt text to all your product images when uploading them to WooCommerce. You can also edit your old product images in Media library and add alt text to each of them one by one. 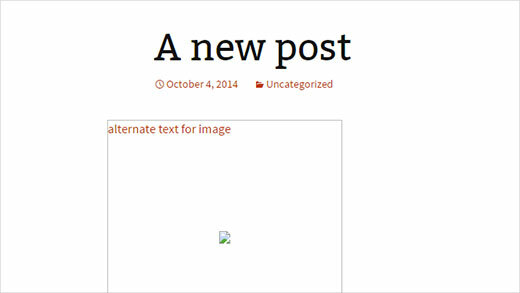 To learn more about Alt text, see our article on image alt text vs image title in WordPress. Each product category in WooCommerce has its own page. This page contains similar products, which increases the keyword density for your targeted keywords. This makes product category pages more significant for WooCommerce SEO. 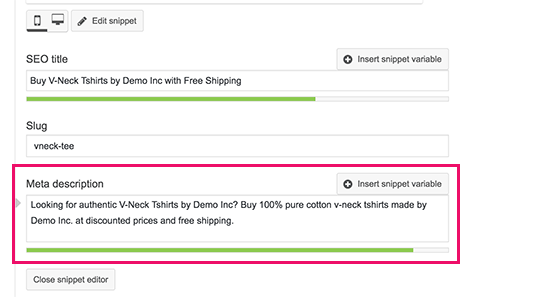 You can further optimize product category pages by adding a title and description to them. Yoast SEO allows you to set SEO title and description for each category on your WooCommerce store. Simply go to Products » Categories page and click on the edit link below a category. On the edit screen, scroll down to Yoast SEO section and click on the category title in the snippet preview. 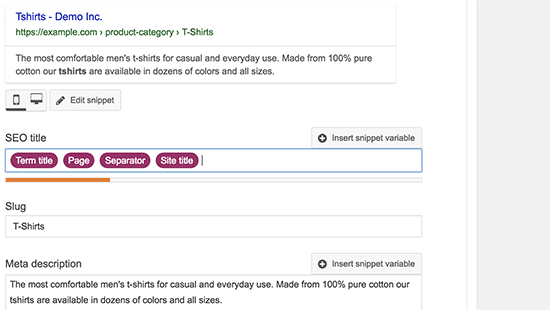 Yoast SEO will now display edit fields to enter your own custom SEO title and description for the product category. The most important part of an effective SEO strategy is data. You need to learn where your users are coming from, how they found your store, what products they looked at, and what are they doing on your store. Google Analytics can help you track all this information, but it’s extremely difficult to set it up properly. That’s why we built MonsterInsights, the most popular Google Analytics plugin for WordPress. The pro version of MonsterInsights comes with built-in eCommerce tracking feature that you can use to enable WooCommerce enhanced eCommerce tracking with a single click. You can use MonsterInsights combined with Google Analytics to make data-driven decisions about your WooCommerce store and grow your business with confidence. 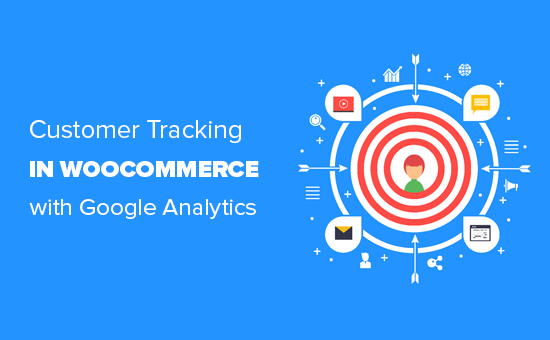 To learn more how to use Google Analytics’ advanced eCommerce features, see our article on how to enable customer tracking in WooCommerce. Google considers website speed as one of the most important ranking factors. This means faster websites are more likely to rank higher than slower websites. Slow websites are also bad for your business because they affect user experience and cost you actual money. According to a StrangeLoop case study, a 1 second delay in page load time can lead to a 7% loss in conversions, 11% fewer page views, and a 16% decrease in customer satisfaction. Majority of the times, the #1 reason for a slow WooCommerce store is web hosting. If that is the case, then you can switch to one of these optimized WooCommerce hosting providers. You can also follow the step by step instructions in our WordPress performance guide to speed up your website. Search engines love websites that are safe and secure. 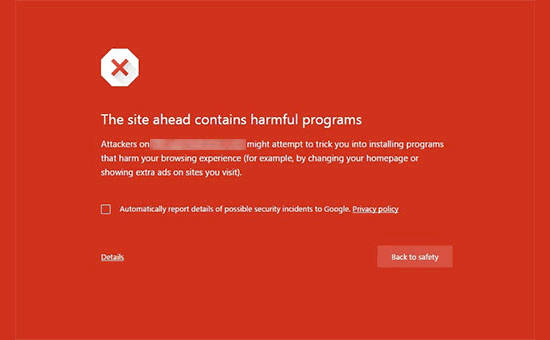 Google warns users from scams, malware, and phishing websites, by quickly marking unsafe websites with warnings. This could not only destroy your WooCommerce SEO rankings but will also have a severe impact on your brand’s reputation. Hackers are always targetting random websites with brute force attacks, malware injection, and data theft attempts. To prevent this you need tighten your WooCommerce store’s security. Follow the step by step instructions in our WordPress security guide to harden your WooCommerce security. We hope this article helped you learn how to improve your WooCommerce SEO. You may also want to see our list of the best WooCommerce plugins to help you grow your business. What about the URL’s? Apparently WooCommerce does not allow short URL’s. Is there a way around it? I am regularly reader of wpbeginner. Always have great info. thanks for this helpful and full of knowledge article.